The Environmental Quality Incentives Program is a conservation program within the USDA’s Natural Resources Conservation Service (NRCS) that provides financial and technical assistance to farmers for implementing sustainable conservation practices on their land. More broadly, the program is meant to help farmers comply with local, state and federal environmental regulations. 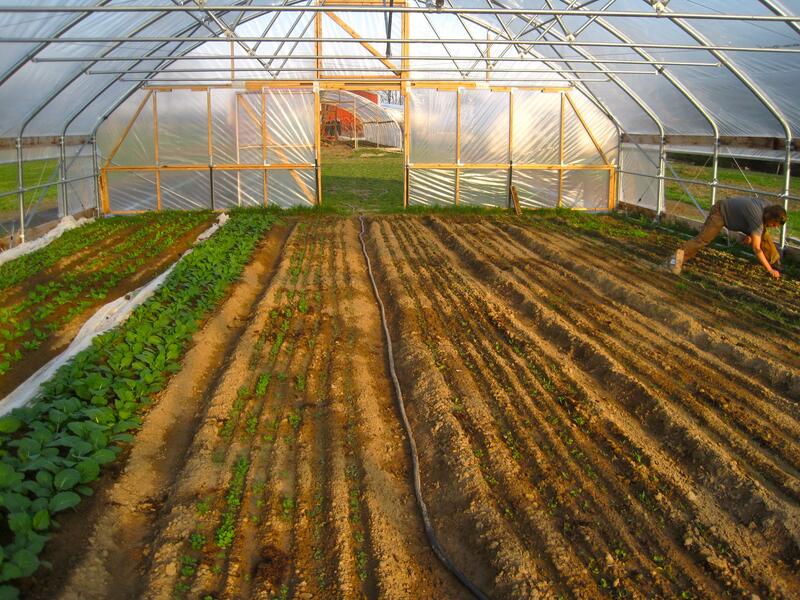 High tunnel construction costs are just one way that EQIP can help your farm. Like many sustainable agriculture incentives, the fate of program is in limbo as a new Farm Bill struggles to take shape, but this is a general overview of the program under the 2008 bill. The National Sustainable Agriculture Coalition also has a good overview. The program, more commonly referred to as EQIP grants in the alphabet soup of the Federal government, is structured through contracts that can vary from one to ten years, but average two to three years in duration. Most farmland is eligible under the program, and producers do not need to own the land to apply. State conservationists and working groups have a large say in determining criteria and priorities for the contracts, so EQIP tends to vary from state to state. For more information about EQIP priorities in your state, check out the NRCS’s state directory before you apply. For example, the New York state conservation office lists several state-specific initiatives including: anaerobic digestion, oil spill prevention and seasonal high tunnels. Nationally, sixty percent of EQIP funding is reserved for livestock producers. The NRCS has also established nationwide conservation initiatives, which include air quality, on-farm energy, conversion to organic and seasonal high tunnels. EQIP also now lists Organic Conservation Assistance, forest management and energy conservation practices as fundable projects. The program gives special consideration — a higher percentage is matched in the cost-share program in many states — to historically underserved producers, including beginning farmers. Farmers can apply for EQIP grants online through their state conservation office’s site. Applications are accepted on an ongoing basis, but there is “cut-off” deadline for reviewing proposals that can vary based on the specific initiative you are applying under, so be sure to scour your state’s website thoroughly. After submission, each application is then ranked based on the state and national priorities. The EQIP program is a part of the USDA’s Natural Resources Conservation Service. Currently under the 2008 Farm Bill, EQIP grants are capped at $300,000 per person or legal entity, directly or indirectly for any 6-year period (although the USDA can raise that limit to $450,000 for projects of “special environmental significance”). Payment rates are generally capped at 75 percent of the total cost, but again higher rates may be available for beginning farmers (up to 90 percent under the under-served producer provision) or 100-percent in some cases of farmers who sacrifice income as a result of the implementing a new conservation practice. To make the cost-share system more clear, NRCS now lets farmers know the repayment rates when they first enroll in the program rather than them waiting for receipts to be evaluated. Again, because the Farm Bill is in such flux, and because EQIP priorities can vary so much from state to state, check with your state’s conservation office early and often for more specific guidance. You can connect with your state conservation office via the NRCS directory. Note that as of this post’s printing, EQIP is not receiving any funding for 2013, but hopefully it will be in future farm bills!